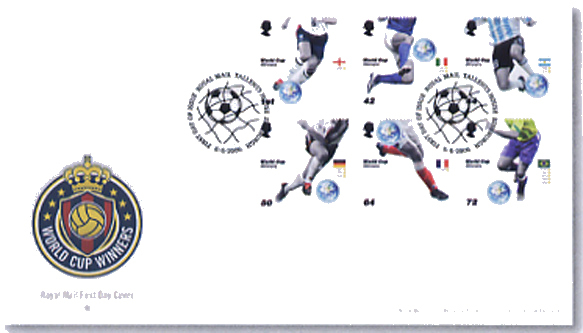 Football World Cup 2006, Great Britain stamps 6 June, from Norvic Philatelics. 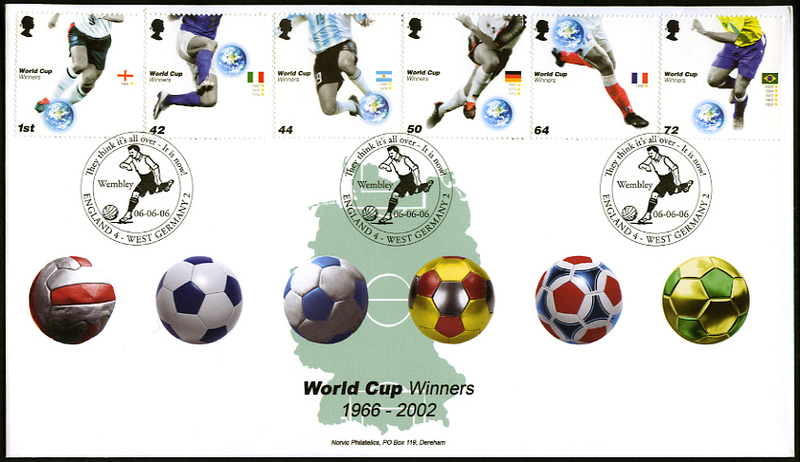 The Football World Cup of 2006 will take place in Germany from 9 June to 9 July. 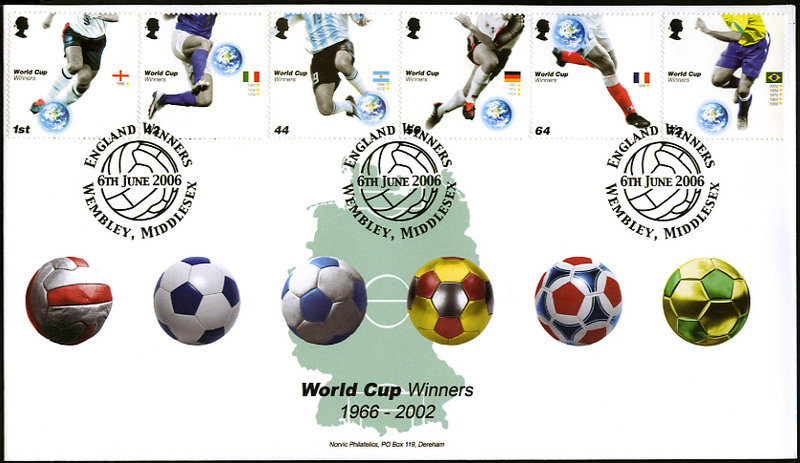 2006 marks the 40th anniversary of England beating Germany in the 1966 World Cup Final, and each of the 6 stamps issued by Royal Mail features one of the six national teams that have won the Cup since 1966. Click on the sheet to see a larger version. 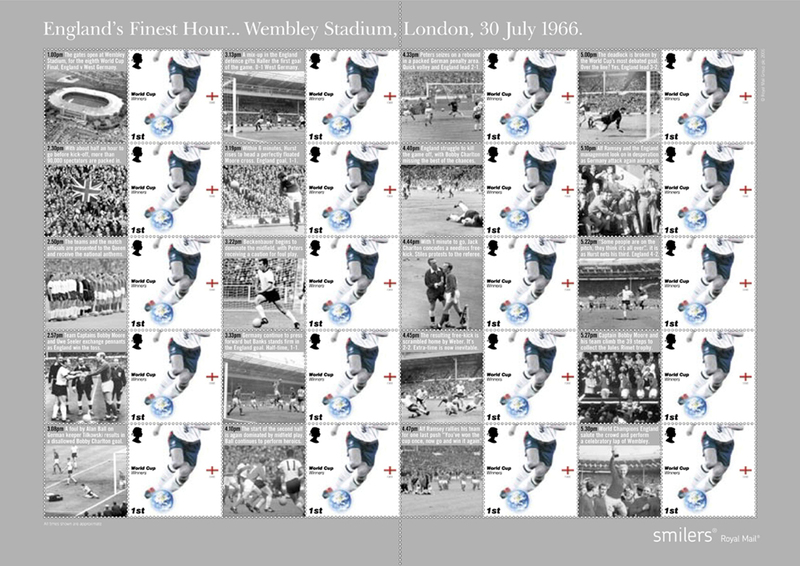 The sheet is captioned "England's Finest Hour... Wembley Stadium London, 30 July 1966". Each of the labels is different, and charts the day from 1pm when the gates were opened to let in 93,000 fans, through to 5.30pm when the England team saluted the crowd and paraded the cup which had been presented to England captain, the late Bobby Moore, by Her Majesty the Queen. 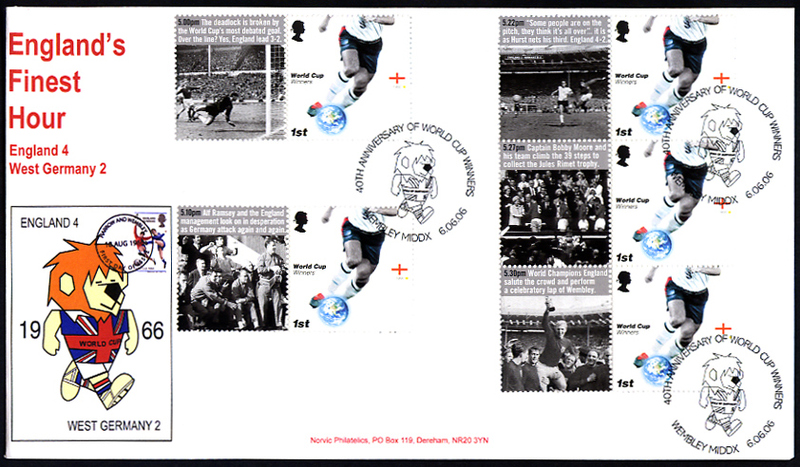 The centre stamp on the 4th column includes the legendary words of commentator Kenneth Wolstenhome, "Some people are on the pitch. They think it's all over .... it is now. ", uttered as Geoff Hurst scored the final goal. 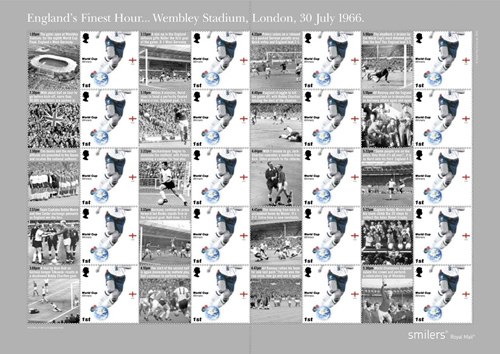 This Smilers sheet was to have been issued at the same time as the miniature sheet to commemorate the opening of the new Wembley Stadium. The postponement of both the opening of the new Wembley Stadium, and of the miniature sheet to commemorate that event meant a change of plans for Royal Mail. 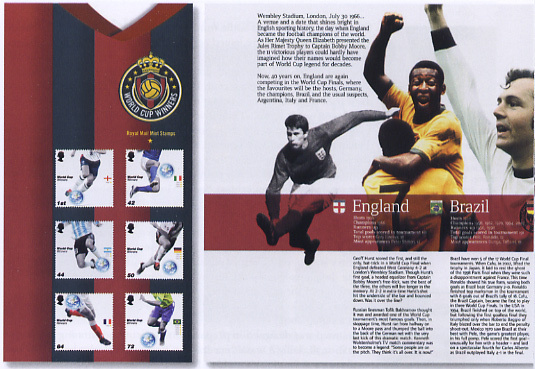 The stamps were designed by Madeleine Bennett using photography from the Getty Images agency. 35mm square, they are printed in litho by Walsall Security Printers, perf 14.5, with PVA gum. All images except FDCs are from Royal Mail's Philatelic Bulletin and Postmark Bulletin, and are Copyright 2005 by Royal Mail. We have produced exclusive FDCs for this issue as usual. As the Smilers sheet has 20 different labels this is offered as single stamps and sets of 4 covers. 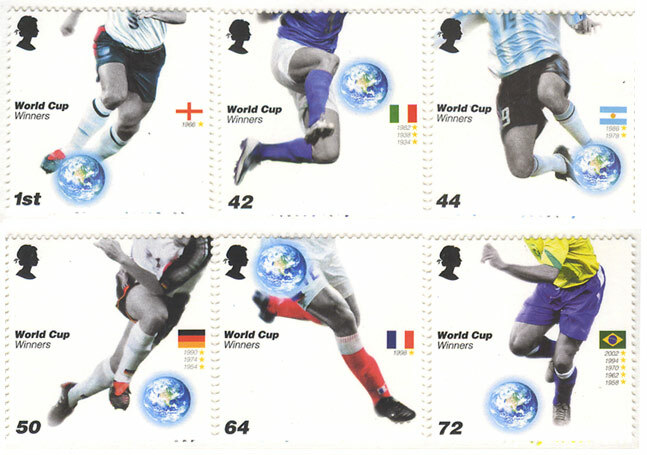 FDC with a full set of World Cup Winners stamps are available with postmarks L10070 and L10071 - price £8.95 each. NB: the cover caption reads 1966-2002 because the Winners are shown for those years. Pictures of Norvic FDCs are actual postmarked covers. Postmarks available for the day of issue are shown below. These may not be to scale. These cannot be obtained after 6 June and must be ordered from us by 1 June. As all postmarks have been added, and we now show actual Norvic FDCs, this page should not be updated again. To order, please follow the link above the FDCs. For any other questions please email us.